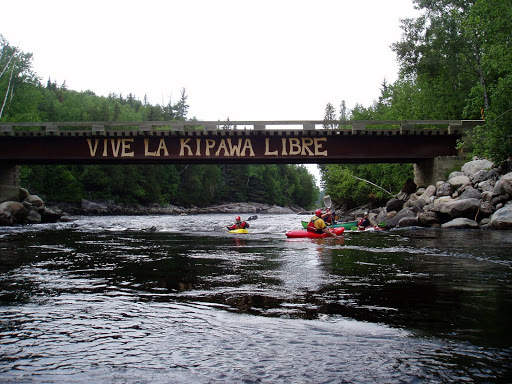 Kipawa Fest Cancelled. So I paddled it anyway. I have had my eye on the Kipawa for quite some time now. Up until this year I didn’t think I was good enough to paddle it, but I have really stepped it up this year. I emailed back and forth with Martin and decided to drive the 4.5 hours north to meet up with him and some of his friends to run the river. Mapquest’s 4.5 hours ended up being 3.5 hours! Sweet! When I arrived, Martin wasn’t there yet, but the cars started pulling in. The lady at the depanneur told us that they shut down the dam this morning. We ran up the street to look at the dam over the bridge. One gate of the dam was closed but the other was still running. The bad news was that it wasn’t the sluice that is runnable. We would have to put on the river downstream of the dam. The river had been running at festival levels for the past week, but we were assured that even with one gate open, it would still be great. We figured out shuttle and ended up taking 3 cars down to the take out and then drove back to the put-in. Once we got back we found out that while we were running the shuttle, the dam operators closed the other gate on the dam! It was going to be a low-water run. Every rapid that is usually big and juicy was now going to be shallow and rocky! Well, I drove all the way up there to run the Kipawa, and by golly I was going to do it! The run was fun anyway, the lines had turned into shallow creeky lines, and I wished I had brought my creekboat instead of the river runner. The company was great and the weather beautiful! I don’t remember each of the rapids, but we ran a few rapids before a LONG stretch of flatwater that ran alongside the highway. I paddled through the reeds, which was a fun way to pass the time! I think the others thought I was a little strange though! We did some flatwater playing along the way, and then came up to the rest of the rapids. We ran some narrow chutes and some technical creeky stuff. We were coming up on Grand Chute, which I was told to take out on the right. ‘Oh we’re going to scout it’ I thought. WRONG! I had no idea that this river was going to take a huge turn in gradient. Grand Chute was a 90 foot drop that [apparently] had only been run once in secrecy. It was enormous! There was a portage trail and observation deck to check out the monster of a channel. The last rapid was called ‘Hollywood’ and consisted of a 5 foot ledge, followed by a 3 foot ledge, with (at this level) a 50-80 foot long manky rock garden at the bottom. This was where the Kipawa River flowed into Lac Temiskaming after a 16 km run from Lac Kipawa. We got out to scout the top ledge of this rapid. Apparently at higher water it’s one that doesn’t get run often as the first ledge turns into a deathly pourover. At this level, those in creekboats were feeling brave and decided to run it. I got out at the top and discovered the hard way that the rocks were not only smooth, but slick and slippery as well (as the river had just dropped 5 feet since that morning) from being underwater earlier that day. This is where my problems began. I slipped on a rock while carrying my boat, and my foot slid in between two rocks that wrenched my big toe backwards. I honestly thought I had broken my toe. I fell down on the rocks with my kayak still on my shoulder. The pain was excrutiating! After I pulled myself up, I realized that I not only yanked my toe back (which screamed with pain at every step), but I beat up my legs, and gave myself a goose-egg on my arm from the cockpit rim of my kayak which made me almost puke when I saw it! After taking photos of people running the ledges (which I would have run if I had my creekboat), I decided I was not walking on those slippery rocks anymore, put my boat in below the 5 foot drop with a dead rat in the eddy and ran the sneak line down and through the rest of Hollywood. I was told it was just dodging a rock garden, so off I went. Sure enough, there was a hole halfway down called Davey Jones Locker, and who should drop right into the hole and get beat down? Yep Jenny Right-Side. I was still in a lot of pain from the on-shore beatdown, and wasn’t 100%. I surfed it a bit, flipped and finally flushed, running the rest of the SHALLOW rapid upside down, scraping my knuckles and banging my head on the rocks. What a way to end the day! Other than that, the day was great, the river was awesome (I want to go back and run it when the level’s higher), and the company couldn’t be beat! A lightning storm ended the run, and I headed back home, having to stop for an hour near Deep River to take a nap I was so beat!